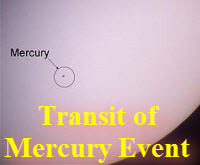 The transit of Mercury across the sun happens between 12:15h and 19:48h, but there will be two WDAS events. At Caedmon College Normanby Site from 16:00h. Good weather is forecasted. Please come along and tell your friends.